A map of German front of the Second World War circa 1941-1942. Maximum expansion of the German occupation. World War II, or the Second World War (often abbreviated as WWII or WW2), was a global war that occurred between September 1939 and May 1945. It involved several nations and their colonies, divided basically between two sides: the Allies and the Axis. More than 100 million people served in military units on both sides. Major Axis nations were Germany, Italy and Japan. 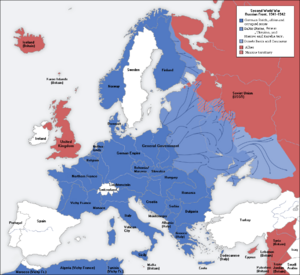 Other nations allied to the axis at some point in the war were Hungary, Bulgaria, Romania and Finland. Some nations also had fighters fighting for the axis on a voluntary basis as was the case of the Spanish legion, the Cossacks and other troops who came to enlist in the Waffen-SS. Other states were created as client or puppet states, like Manchukuo (northern China), the Italian Social Republic (after the surrender of Italy 1943–45), Croatia (1941–45) and Slovakia. The major allied nations were the British Empire, France, Soviet Union (from 1941) and the United States (from December 1941). Many other nations joined the allies as was the case of Poland, Canada, Australia, New Zealand, South Africa, Yugoslavia (from 1941), Greece (from 1940), Norway (from 1940), the Netherlands (from 1940), Belgium (from 1940), Czechoslovakia and Brazil (from 1942). China sided with the allies when World War II started, as the country had been at war with Japan since 1937. In March 1935, Hitler announced conscription in violation of the Versailles Treaty, and a year later, in March 1936, German forces occupied the Rhineland in violation of the Treaty of Locarno. In November 1936, Benito Mussolini proclaimed the Rome-Berlin Axis. In the spring of 1936 it became evident that a conflict between the forces of right and the government forming a left coalition called the Popular Front. On July 17-19, Francisco Franco proclaimed revolution in Morocco. It was the beginning of the Spanish Civil War, which lasted nearly three years. In late July, German and Italian planes began the airlift Franco's army who was in Morocco to southern Spain. The British and French decided by non-intervention. The Soviets supported the Popular Front as the Germans and Italians supported the nationalist forces, including bombings in Madrid. In 1936, the primary objective of the Nationalists was Madrid, the Spanish capital. On 28 September, the Nationalists obtained a resounding propaganda victory by lifting the siege of Toledo. The battle for Madrid lasted 5 months and would see the first serious defeat for the Franco forces. In October 1938, Jews of Polish origin were expelled from German soil. In November 1938 the Germans staged the Kristallnacht purge, the "night of glass" attacking Jewish homes, shops, offices and synagogues in both Germany and Austria. This organized and systematic pogrom was ostensibly an act of retaliation for the assassination of a German diplomat in Paris by a young Jew. About 7,500 Jewish business were destroyed. On October 1, 1938, due to the Munich agreement, made by the four nations of Germany, Britain, France and Italy, Hitler´s army occupied the Sudetenland, the border region of Czechoslovakia whose population was German-speaking. On August 23, 1939, Germany and the Soviet Union sign a treaty of non-aggression also known as the Molotov-Ribbentrop Pact. This was a non-aggression pact between the parties. By signing this pact, Hitler intended to avoid a fight on two fronts as had happened in the First World War. On September 1, 1939 the German army invaded Poland. Two days later Britain and France declared war on Germany. The Germans simulated a false attack from Polish partisans as an excuse to attack. At 4:45 a.m. in the morning, five corps of Hitler's army, backed by the Luftwaffe, invaded Poland soon after Schleswig-Holstein school-battleship opened fire on the fort in Westerplatte in Danzig. Between 1939 and 1940 the Soviet Union, after occupying Poland in 1939, invaded Finland. Stalin demanded the annexation of thousands of square miles of original Finnish territory and basing rights to the port of Hango in southern Finland. The Soviets had several setbacks despite overwhelming superiority in troops. In the battle of Suomussalmi two Soviet divisions were massacred. Several factors contributed to the poor campaign of the Red Army. The action of the Soviet armored was not significant and the Finns attacked them quickly with magnetic charges, grenades and Molotov cocktails. The purge of Soviet officers by Stalin was another contributing factor. With the arrival of Timoshenko, the Soviet units imposed their superiority. The peace treaty was signed in March 1940 with territorial losses imposed on the Finns, but not for long. After the invasion of the Soviet Union, the Finns fought a war in order to further restore the borders which existed before the Soviet invasion. By the first days of February 1945 the Soviets reached the Oder river. In the south, in early March 1945, the Germans attempted a final offensive to recapture Budapest, but without success. The Soviets had already captured Silesia and Pomerania in late March 1945. ↑ Minerbi, Alessandra (2009) (in Portuguese). História Ilustrada do Nazismo [Illustrated History of Nazism]. São Paulo: Larousse do Brasil. p. 122-123. ISBN 978-85-7635-457-4. ↑ 2.0 2.1 2.2 Gilbert, Martin, ed. (1990). The Ilustrated Atlas of the Jewish Civilization. New York: MacMillan. p. 166-169. ISBN 0-02-543415-2. ↑ Azaola, Ramon, ed. (2000). Man at War 1914-1945 - The Spanish Civil War: Corporal, Nationalist Infantry. Madrid: DelPrado Publishers. p. 4. ISBN 84-8372-516-9. ↑ 4.0 4.1 Lannon, Frances (2002). Essential Histories - The Spanish Civil War: 1936-1939. Botley, Oxford: Osprey Publishing Limited. p. 11. ISBN 1-84176-369-1. ↑ 5.0 5.1 5.2 Romero, Javier (November/December 2003). Miranda, Joseph; Cummins, Christopher. ed. "The Spanish Civil War". Strategy & Tactics (Bakersfield: Decision Games) (219): 6-20. ISSN 1040-866X. ↑ 6.0 6.1 Barnavi, Eli, ed. (1992). A Historical Atlas of the Jewish People. New York: Schocken Books. p. 226. ISBN 0-8052-4127-2. ↑ Tucker, Spencer C, ed. (2005). World War II:A Student Encyclopedia. Santa Barbara, California: ABC-CLIO. ISBN 1-85109-857-7. ↑ Cardona, Gabriel; Vásquez, Juan (2009) (in portuguese). Coleção 70º aniversário da 2ª Guerra Mundial [Collection 70th Anniversary of World War 2 (volume 2:1939: Germany Dominates Poland)]. 2 - 1939: A Alemanha Domina a Polônia. São Paulo: Abril Coleções. p. 12. ISBN 978-85-62605-02-4. ↑ 9.0 9.1 Losada, Juan Carlos; Vásquez, Juan (2009) (in Portuguese). Coleção 70º aniversário da 2ª Guerra Mundial [Collection 70th Anniversary of World War 2 (volume 3:1939: Finland against USSR: War in the Snow)]. 3 - 1939: Finlândia contra URSS: Guerra na Neve. São Paulo: Abril Coleções. p. 63-83. ISBN 978-85-62605-03-1. ↑ 10.0 10.1 Ziemke, Earl F (1968). Battle for Berlin:End of the Third Reich. New York: Ballantine Books Inc.. This page was last modified on 6 February 2016, at 00:00.